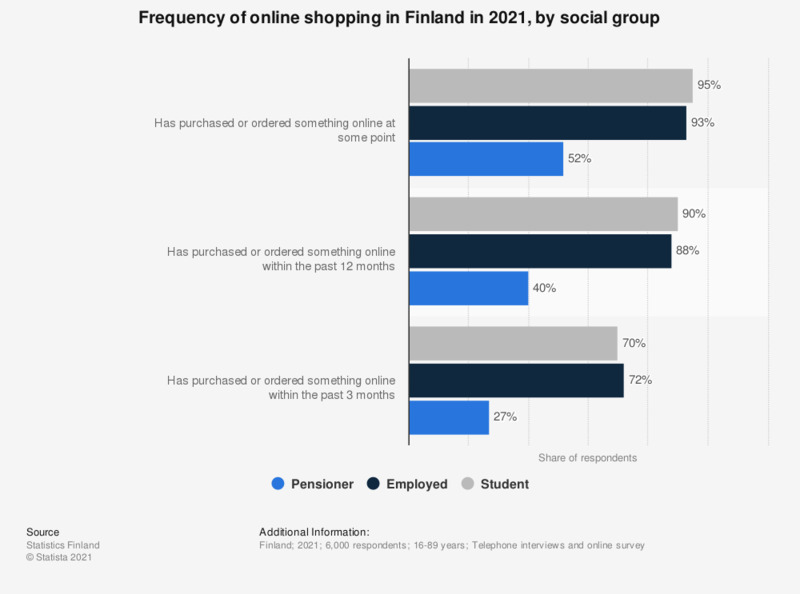 This statistic shows online shopping frequency in Finland in 2017, by social group. In 2017, 89 percent of students had purchased something online, whereas 72 percent had submitted an online order within the last three months. The corresponding figures for pensioners were 33 and 19 percent, respectively. The survey material is emphasized to correspond to the whole population and households, taking into account the response losses. The compilation of the statistics is regulated in the Statistics Act (280/2004). Why did people cancel their online shopping basket? Have you ever cancelled an orders process? How long since you made your first ever online purchase?